University of Missouri researchers set out to find what physicians like and dislike about electronic clinical notes. The pendulum has swung. Paper records, where information was sometimes lacking, have steadily evolved into EHRs. Ironically, that digital age advancement has ushered in the opposite problem. "There's too much information, and now it comes at us in a very dense form," says Richelle Koopman, MD, MS, an associate professor of family and community medicine at the University of Missouri School of Medicine, who likens the generous EHR data streams to trying to drink from a fire hose. Noticing that the phenomenon was causing problems among EHR users at Missouri, Koopman and her colleagues undertook a study to determine where issues were lurking in EHR workflows. The study, "Physician Information Needs and Electronic Health Records (EHRs): Time to Reengineer the Clinic Note," concentrates specifically on the clinic note from the patient's most recent visit. The researchers examined scenarios in which physicians reviewed a previous encounter in preparation for the patient's upcoming visit. "What they would normally do is look at that patient's last clinic note," Koopman says. Physicians were primarily interested in what the diagnosis had been and what the plan was moving forward—medications prescribed, the patient's action items, etc. They also may review how the diagnosis was developed, the patient's history, and any findings on exam. Koopman's research uncovered a few aspects of the notes that physicians frequently didn't find helpful. One such area was the review of systems, in which physicians run through the different body systems and indicate if any problems existed. It's a long section, one that is rarely needed in its entirety for any one patient. "It actually caused quite a bit of consternation with physicians that we interviewed," Koopman says, noting that many felt that anything important should be included in the history rather than hidden in the lengthy review of systems section. Physicians found the format markedly inefficient and often difficult to navigate. Koopman says the dislike for the review of systems ran so deep that one physician even stated it was their life's goal to get rid of it. Similar inefficiencies in EHR platforms were discussed at length at a large health care organization that was the previous employer of Amy Czahor, RHIT, CCS, CDIP. A recurring issue—not just from physicians but also among the compliance, HIM, and quality teams—was the push toward discrete data, which is a byproduct of the drive to put everything in the EHR in order to meet meaningful use requirements. "We make all these fields and we push everybody toward templates," says Czahor, now vice president of optimization and analytic services at RecordsOne. "But we've lost the patient story. We've lost that narrative." She says one physician leader described it as trying to read A Tale of Two Cities in tweets. "You're trying to read a novel in these little, parsed out sentences," Czahor explains. Other physicians mused that they would never type as much as they would say if they had been dictating, indicating that patient records may contain less useful information than ever before. "There are so many limitations based on what we want on the back end to capture this discrete data for things like population health management and other use cases, but the doctors just want to take care of the patient and tell the patient's story," Czahor says. 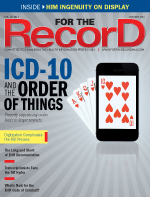 Drew K. Siegel, MD, CCDS, CPC, a clinical documentation improvement (CDI) specialist at MedPartners HIM, says some physicians turned to copying and pasting as a solution to excessive data entry. Typically, they'll copy case notes from previous days into the daily note. "You'll see four or five days where the same note is being copied and pasted," says Siegel, who is based at a large academic medical center in St. Louis. When it's time to read back through the chart, the information is unwieldy and the chronological history of the patient is lost. "As an example, it may say a procedure is pending, and every day it says the same thing," Siegel says. Even once the planned procedure is complete, the same note continues to carry forward. "They're pressed for time," Siegel says of physicians. "Especially the interns and residents—they're pressed for time so they're not changing all those little details in the record." That makes it difficult to follow along with the patient, and creates challenges for coders, documentation improvement specialists, and others who rely on EHR data. Given everything that physicians need to capture from a patient encounter, is it even possible to place that relevant context in the EHR? Jay Vance, CMT, CHP, AHDI-F, president of the Association for Healthcare Documentation Integrity, says it can definitely be done. "The technology is very much available and accessible to include and accommodate free flow narrative text," he says. "It could be generated through dictation and transcription, speech recognition technology, or from free text typed by the provider." Hectic schedules may make it difficult for physicians to proofread their own entries, making it essential that any type of clinician-created documentation be reviewed. But those aspects of the workflow aside, the technology does exist to design EHRs to properly gather and store each patient's story in a more workable format, Vance says. However, if not carefully planned and implemented, any customization of existing EHR platforms to make the system more usable could actually lead to new problems. Streamlining the process for physicians, such as developing templates or tools that act as shortcuts, creates potential gaps in data capture. "It makes it very hard—when you're looking at it from a health care organization's perspective with thousands of physicians that are putting data into your EHR—if they're all doing it differently," Czahor says. "They're missing elements that we really need but they don't realize it. They're just trying to lessen their administrative burden." In some cases, the tools may already exist within the EHR to better document the patient encounter. Issues may reside more in physicians' preferences than the technology itself. "Every single EHR has a narrative block somewhere that the physician can access, but it requires them to actually sit at a keyboard and type," says Laurie Hilyard, RN, MSN, CCDS, a senior health care consultant at Panacea Healthcare Solutions. That's likely to be something more easily embraced by physicians who are fast typists or those for whom technology is already an integral part of how they get things done, she adds, noting that today's residents are more likely to quickly leverage technology. While physicians may find certain sections of the EHR notes less than useful—or downright unnecessary—that doesn't mean other professionals don't need them. Coders and CDI specialists are among the groups likely to use data in the EHR on a daily basis. "In some of these sections—for example, the review of systems, the physical examination sections—the actual billing is driven from how many body systems are addressed," explains Lynn Kosegi, director of solutions realization at M*Modal, who's heard "horror stories" about hospital staff being asked to complete an entire template even if the physician worked in only one small section. That doesn't mean the information submitted into the EHR by physicians isn't crucial. "It tells every physician in the hospital all they need to know in order to safely treat that patient," Hilyard says. However, she notes, important details about diagnoses and treatments aren't necessarily being included because the process is time-consuming and the systems are unwieldy. "All of the verbiage may not be necessary for the safe treatment of the patient, but the insurers want the detail," Hilyard explains. For example, blood loss during surgery may not be something a physician feels compelled to add to the record. Insurers, who want to know if that blood loss is due to chronic anemia, an acute condition related to a recent surgery, or something else, believe differently. "Physicians get frustrated by that because they don't want to go into that level of detail when it makes no difference to them either way. The immediate treatment is the same," Hilyard says. Changing the needs and resources on either side of the coin is a challenge, she says, but streamlining the workflow may be one way to ensure all parties get what they need out of the EHR without burdening any one group. In many health care organizations, obvious solutions to improving EHR workflow have likely already been implemented. Meanwhile, the remaining concerns will take creativity and an understanding of the needs and concerns of everyone involved. Acknowledging the genesis of the current format may be helpful. "We have to recognize that we've moved from a paper to an electronic world and we haven't made that switch perfectly," Koopman says. When EHRs were first introduced, many of them were designed to look much like paper records. "It worked to ease the transition and to provide physicians with something that felt near to what they had been doing before," Koopman explains. However, EHR documentation has evolved to encompass increased reporting and billing, resulting in data volume that dwarfs the amount of information found in conventional paper records. Navigating that changing landscape underpins many of the concerns physicians have raised. Returning some of the functionalities physicians used to have in the days of paper records may prove helpful in ensuring the documentation process remains efficient. "We freely acknowledge there are certain elements of a patient encounter that would probably make more sense to have some sort of point-and-click menu, or perhaps have the front office staff or a medical assistant complete certain parts of the patient encounter," Vance says, adding those steps may save time without diminishing data quality. "But when it comes to actually telling the patient's story, the physicians need the option to do that in a variety of different ways." Whether that means dictation or some other method, physicians must find a process that best suits their skill set and comfort levels, Vance says. Offering several ways to enter data into the EHR may lead to more streamlined workflows and result in more favorable attitudes toward EHRs, he adds. Because there are many stakeholders to consider, Hilyard says potential improvements likely will depend on individual perspectives, noting that if she were a physician, customization would be key. For example, a bariatric surgeon, who is unlikely to operate on a patient with grossly impaired renal function, won't want to wade through pages of kidney dialogue. On the other hand, nephrologists would find that information to be essential. From a coding or CDI perspective, Hilyard says, "I want all that detail from any specialty physician coming through so I have something to code from." In ICD-10, specificity takes on added significance, illustrating the further importance of finding the balance between an abundance of data and ease of use. The Missouri team is designing steps to improve EHR workflow and address the physician concerns identified in the study. Koopman says the organization is currently working with its platform vendor on tweaks. "We asked our physicians to prioritize their most important things as well as those items that were not needed as much. The diagnosis and the plan were identified as the most important," she says. As a result, Missouri developed a note in which the priority items were located at the top and less useful sections were "hidden" or removed altogether. To assess the new format, the researchers are measuring physician accuracy and speed. They're also employing the NASA Task Load Index, a tool designed to measure how much mental work a task requires, to evaluate physicians' cognitive load. Results are still coming in, but Koopman says, "The early results say that putting things at the top is good, but we are getting sort of mixed results on the 'hiding information' part." Still, Missouri physicians have thus far shown increased efficiency in accessing the information they actually want to view. Through a rigorous testing process, Missouri hopes to identify how well the strategy works in the long term across its physician base. EHR vendors have significant influence over which changes are adopted over time and how platforms evolve. Czahor suggests looking at some of the successful health information exchanges that gather and assimilate data from multiple disparate sources. "If they're able to do that successfully, perhaps the EHR vendors need to take a page out of that book and start looking at it from that perspective," she says. Rather than striving to serve the provider community, Czahor believes it may be more effective in the long term for vendors to focus on patients. "If everyone looks at it from the patient perspective, I think it starts to break down some barriers," she says. The proprietary nature of most EHR platforms may be a roadblock on the path to changing workflows. Because there is significant money involved in the research, development, and design of any EHR solution, Siegel believes vendors may be less likely to give away competitive information just to increase interoperability. "The meaningful use standards have tried to work that out somewhat, but there's still a lot of difficulty because economically they don't want to share how their system works," he explains. However, Siegel still sees opportunities to better fit a platform to the needs of its users. "I do think the vendors can work closely with physicians and other clinicians to develop their systems," he says. Get clinicians involved at an early stage in the implementation life cycle, where vendors tend to build the platform around their needs, rather than trying to customize it after installation, Siegel says. Kosegi says the industry's shift to EHRs has been an educational opportunity for both provider organizations and vendors. "They've learned what doesn't work with the clinician's workflow," she says. "We've all learned about what causes problems and ways to capture the right information." A willingness to work together will go a long way toward solving physician workflow issues, Kosegi says. The provider side of that discussion should feature a team that includes "representatives from HIM, revenue cycle management, and certainly lots of representation from the clinical side," she says. An inclusive approach will ensure that the necessary data are captured to support every group that relies on the EHR and give providers a voice to more clearly define how best to capture important patient care information.